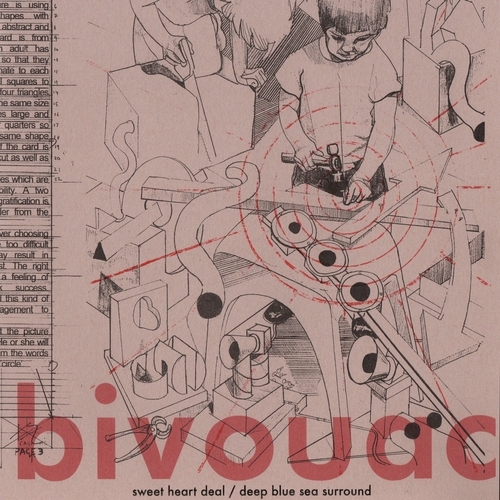 After a twenty year hiatus '90s alt rock legends Bivouac announced their return with a double-A vinyl only single released through Reckless Yes Records. Featuring one new song (Sweet Heart Deal) and one reworking of a track from the band’s heyday (Deep Blue Sea Surrounds) the single will be available as a limited edition (250 copies) pale green opaque vinyl 7” in hand-numbered wrap around sleeve. Signed to independent label Elemental following their first gig in 1992 the band were an indie success story, finding underground popularity with their British take on the Seattle grunge sound. A slew of singles led up to the release of their debut album Tuber in 1994 after which the band were signed to Geffen and released follow-up long player Full Size Boy in 1995. Like so many indie bands swept up by major labels in the 1990’s the band found that the dream wasn’t all it was made out to be. They split up in 1996 but reformed at the start of 2016 following an offhand mention in a newspaper column by comedian Stewart Lee led to renewed interest in the band from fans.